White-nose syndrome is a fungal disease that has killed millions of bats in North America since its discovery in 2006. By 2013, the disease had spread to 22 states and five Canadian provinces. Mortality rates are close to 100 percent. What are scientists learning about white-nose? Can anything stop its spread? Are there any possible treatments? Why should we care about bats in the first place? Those white spots on the wing of this bat are evidence of white-nose syndrome. 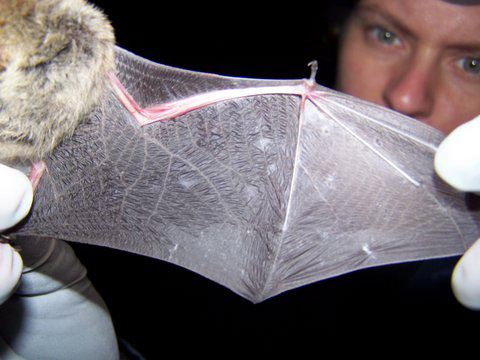 Based on the odds, this bat was lucky to survive the deadly fungus. How do scientists seek to understand a new disease? If appropriate to class level, explore Koch’s postulates. What roles do electrolytes play in animal metabolism? How do the researchers propose to test whether electrolyte supplements can help bats survive white-nose syndrome? Why would a pathogenic virus or bacteria get an evolutionary disadvantage from being 100 percent deadly? Does this analysis apply to a fungus like G destructans? 1. Research paper: What happened when Europeans (deliberately or accidentally) brought the smallpox and measles viruses to the New World? Why are “new” diseases so dangerous to newly unexposed populations? What are the parallels between this historic situation and white-nose syndrome? Ask students to outline a research plan for a small animal that hunts in the dark. What instruments, tools and specialists would be useful?